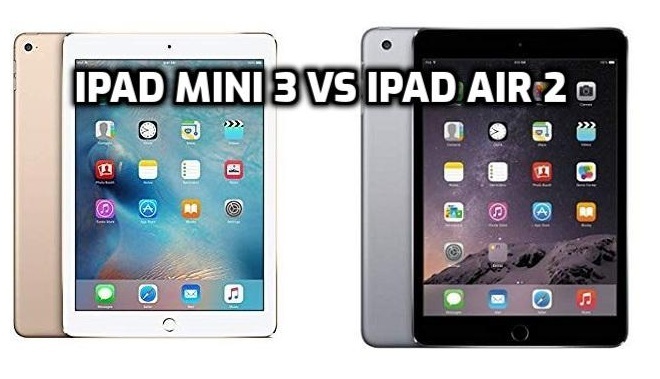 iPad Air 2 vs iPad Mini 3 – A comparison between 2 of the most gorgeous Apple models. Apple released the iPad mini 3 along with the bigger iPad Air 2. The first thing we want to point out about the new iPad mini 3 is that it is incredibly similar to the iPad mini 2. The only notable difference is the introduction of the Touch ID fingerprint sensor and the gold casing option along with the silver and slate grey. The new Apple iPad Mini 3 is beautiful in design, build and quality. Its brushed aluminium case, available in the previously mentioned new gold finish, as well as the silver and slate grey options. The addition of the gold model of iPad mini 3 didn’t come as a huge surprise, as it brings the iPad range in line with the new iPhone ranges. The gold option was first introduced with the iPhone 5S, and now, the iPhone 6 and iPhone 6 Plus both come in gold too. Apple has said that the gold option has proven to be a very popular colour choice for the iPhone. The bevelled edges surrounding the glass front of the iPad mini 3 add to the overall premium finish, and look great paired with the Home button’s new Touch ID fingerprint sensor, which has a matching metal ring around it. The Apple iPad Air 2 is an super fast, amazingly thin tablet with stunning looks. Find out more in our iPad Air 2 detailed review, which includes camera tests, audio tests, speed tests, battery tests and an insight into the iPad Air 2’s features, design and specifications. Apple’s iPad Air 2 has landed and unlike its little brother, the Mini 3 – it has been adorned with enhancements and new features. It’s super fast, it’s super thin and it’s super gorgeous to look at. Fact:The iPad mini 3 is only 7.5mm in thickness (for comparison, the iPad Air 2 is an amazing 6.1mm), and weighs 331g for the WiFi only model or 341g for the WiFi + Cellular model. We didn’t once think that the iPad mini 3 should be thinner, but we did occasionally feel that it’s a little bit heavy when holding it in one hand for more than 10 minutes, particularly with Apple’s Smart Cover attached. Apple’s iPad mini 1 was actually a bit lighter than the iPad mini 2 and iPad mini 3, so we’d like to see Apple shave off a few grams with the next generation of iPad minis. Strangely, the larger iPad Air 2 (which has a 9.7in display rather than a 7.9in display) felt more comfortable to hold, despite being around 100gm’s heavier. Probably something to do with the different way we actually hold the device during use. The Touch ID fingerprint sensor on the iPad mini 3 works to perfection, not a single problem. It’s a doddle to set up and easy to use. If you own an iPhone 5S, iPhone 6 or iPhone 6+ then it will come naturally to you. It’s a huge time saver, as you don’t need to enter your passcode every time you want to unlock it. This new technology also allows you to unlock certain apps and make purchases in the iTunes Store, App Store and iBooks Store. If your favourite shopping sites have Apple Pay implemented, you will be able to use it to do your online shopping. Apple Pay and Touch ID will not work in shops and stores, Apple obviously believes that people are unlikely to take their iPad shopping in the real world, I tend to disagree. Apple hasn’t made any changes to the 7.9in Retina display on the new iPad mini 3, but it remains to be a great screen that owners of the original iPad mini are missing out on. The iPad mini 3 display retains the same resolution: 2048 x 1536 resolution at 326 pixels per inch. That’s a better pixel density than the iPad Air 2 which the same resolution but at 264 pixels per inch due to the bigger screen. The displays on previous generations of iPad used three separate components. iPad Air 2 changes all that, combining those three layers into just one. This eliminates gaps between layers, along with the internal reflectance caused by those gaps. The result? Colors are richer, contrast is greater, and images are sharper and more vivid. The iPad mini 3 has, you guessed it, the exact same processor as the iPad mini 2 – the A7. It seems as though Apple has focused most of its attention on the iPad Air 2 (above left) this time round, which has a very powerful (and actually new) A8X chip. Last year we were surprised that really the only difference between the iPad mini 2 and the iPad Air was their size. Now there will be more reason to buy an iPad Air, which is good news for Apple as they can make more money from that model, but also a bit disappointing for lovers of the smaller form factor. Not that the A7 chip is a slouch. It’s a very fast, 64-bit processor. The iPad mini 3 also features the M7 motion co-processor, which helps save power by taking on the task of measuring motion using the built-in accelerometer, gyroscope and compass. Both the A7 and M7 feature in the iPhone 5s. We carried out benchmark tests on the iPad mini 3 to find out whether there’s any difference at all between it and its predecessor when it comes to speed and performance (perhaps it was wishful thinking) and also how it compares with the brilliant iPad Air 2. In the Geekbench 3.0 performance test, we found that the iPad mini 3 (running iOS 8.1) scored 1376 in the single-core test and 2483 in the multi-core test, which is almost identical to the iPad mini 3’s scores of 1374 and 2484. That is much better than the iPad mini 1 running iOS 8.1, though, which scored a significantly lower 260 (single) and 494 (multi). The iPad Air 2 has a new processor chip – actually its a newer version of a the processor chip that was launched in October 2014. It is the A8X, an enhanced version of the A8 chip that first made its appearance in the iPhone 6 and iPhone 6 Plus last month. Apple has said that last year’s A7 chip was a departure from the norm – normally Apple makes specific chips for the iPad. Because of the scale with 64bit Apple was able to use the A7 chips in the iPads last year, but this year Apple has given the new iPad Air an all new singing and dancing power processor. Welcome to our Planet The A8X. The iPad Air 2, on the other hand, is incredibly powerful judging by our benchmark tests, scoring 1818 in the single-core test and a whopping 4520 in the multi-core test. As for graphics, the iPad mini 3 is good but isn’t in the same league as the iPad Air 2. It scored 8.9fps in the Manhattan onscreen test in GFXBench, identical to the iPad mini 2 but way behind the 24.6fps of the iPad Air 2. The T-Rex test results were more impressive, at 22.7fps for the iPad mini 2 and mini 3 and an incredible 52fps for the iPad Air 2. The iPad mini 3 is not a bad tablet. In fact, it’s a rather good one, but it’s a bit of a poor offering. We would find it hard to recommend buying the iPad mini 3 when the iPad mini 2 is available for much, much less and is almost exactly the same, and the hugely more powerful and impressive iPad Air 2 is just $100 more. The only reason to buy the iPad mini 3 instead of the other iPads available is if you’re set on a 7.9in screen and are desperate for a gold model and you think you can not live without Touch ID. If that’s you then you won’t be disappointed by this tablet, but a new processor and some other spec upgrades would have certainly have been appreciated. Thank you for reading our iPad Air 2 vs iPad Mini 3 review. If you like it please spread the word.